The emerging crisis of water shortage is now getting more headlines, and it is noticeable that the political debate now must include measures to cope with the pending emergency. Across the nation, from northern California to southern Florida, communities are at risk of simply running out of water. In January 2014, The California Department of Health produced a list of 17 communities that are within 100 days of running dry. The population of the U.S. has grown by 99% since 1950, and water demand has surged by 127%. So a combination of climate change and demand growth is placing unprecedented demands on potable water, and a recent report by Columbia University cites water stress in many US cities, including Cleveland, OH, Miami, FL, and several Texas cities including Houston and El Paso. Several regions now have in place plans to replace the use of potable water by reclaimed wastewater. Many are turning to UV as an effective barrier to enable the reuse of wastewater, for indirect reuse, and aquifer recharge. UV has been used since 1917, and it is expected that UV will overtake chlorine as the predominant disinfection method for wastewater within 15 years. UV is a simple, physical and non-intrusive method of rendering organisms non -viable, and thus unable to replicate or cause further nuisance. Many microbes now demonstrate tolerance to chlorine; this should come as little surprise when one considers how mosquitoes have overcome insecticides, how weeds overcome herbicides, or indeed how microbes easily overcome antibiotics. UV light works by blowing apart the DNA, found within all living organisms. When the UV becomes damaged, the normal cell function of respiration, replication and reproduction rapidly cease. It has been noted on a number of occasions that when the microbes are exposed to sunlight, that some repair is observed. This phenomena has led to the older open channel style UV systems being covered, and indeed has promoted the use of closed vessel UV systems that keep the sunlight away and the waste streams completely away from plant operators. UV system design has benefitted tremendously from the use of Computational Fluid Dynamic (CFD) models in the last decade. These models allow system manufacturers to understand fully the performance aspects of their equipment, and critically allow the regulatory community to actually understand the impact of ancillary equipment such as butterfly valves, or directional elbows have on the performance of the UV system. As UV became a standard barrier for the drinking water community, the same rigors is now being applied to UV use for wastewater, or reclaim water. Once the CFD model has been developed, the model is iteratively refined to improve the accuracy when compared to the actual microbial performance of the UV system. Typically the leading UV manufacturers are now able to make extremely accurate predictions. 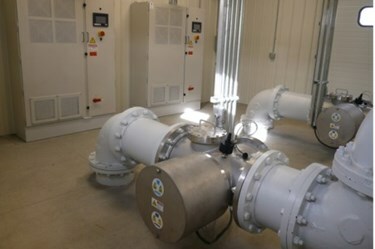 The wastewater systems are validated, usually by an expert third party such as Carollo Engineers, or HDR HydroQual. The performance envelope for the validation experiment is given much consideration as a typical NWRI (Title 22) system validation can cost well over $ 200,000 per reactor. The largest lamps currently in use in closed vessels are 800watt amalgam lamps. The older medium pressure systems that first appeared for reuse applications are too inefficient, as areas where water reuse is needed it is typically hot and air conditioner units are very popular. This makes water reuse areas not just water stressed, but also power stressed. Many water reuse communities will need to ration power in the hottest months of the year. Amalgam technology will consume approximately 1/3 of the power of a medium pressure unit, so communities who were early adopters are now able to upgrade their older UV systems and see rapid payback due to energy savings. In the face of unprecedented climate change, and surging water demand we have no alternative other than to examine ways of conserving water. Many traditional uses of water, such as agricultural use, urban irrigation, dust control, enhanced oil recovery (hydraulic fracturing) will all switch, or have already switched from using potable water to using reclaimed water. In many inland communities, the scarcity of available water is leading to the direct reuse of water. The challenge quickly becomes one of communication and ensuring that complex, and emotive issues that pose the professional water community little issue are well explained to a non- technical customer. In reality we have no choice, but let us take the time to explain carefully how well protected we really are, and that we do have an optimistic outlook after all. Jon McClean is President of Engineered Treatment Systems, LLC, and is based at the ETS factory in Beaver Dam, Wisconsin. He has an undergraduate degree in Physics and an MBA from Imperial College, London.